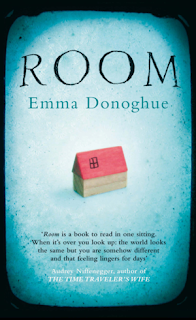 As with The Long Song, Room's main of several triumphs is its narrative voice. Emma Donoghue's novel is one of the most distinctive & original books I've read in a while, combining both a fascinating central premise with a well-realised voice. Jack, who turns five at the start of the book, & his mother live in a small room, which also forms the limits of their world. They never go outside. For Jack, the world is divided into the Real (him, his Ma, and everything in their small room) and TV (things he sees on television). He recognises that there is an Outside, but his mind doesn't really process how that works or what that Outside entails. Therefore, from Jack's perspective, there exists only one of everything - the one that is in their room. Thus, as he narrates the story, he says things like "Ma leans out of Bed to turn on Lamp". Why these two people confine themselves to Room is only gradually revealed. This is a novel that it would be very easy to spoil, so I'll avoid plot details beyond the premise as outlined above. Jack's voice, as narrator of this story, is pitched perfectly, as Donoghue gets deep into his skin & observes what it must be like to have spent one's entire (albeit young) life in one small room, with only one's mother and the television for company. As he grows, his mother tries to explain what Outside is actually like, but Jack is fundamentally unable to understand what she tells him - he has no frame of reference for the idea that there are things and people beyond the two of them. Room is thus largely about perception, and perhaps also about how our version of the world is a consequence of how & where we were brought up. Again, I won't reveal any details, but I will say that the story developed in an interesting way - for a while I was concerned that the basic premise would never really be explained satisfactorily, which would have significantly hampered my enjoyment of the book, I think. But instead Room makes the most of its ideas, filling in some backstory while also moving forwards in the narrative. It's also quite a quick read, despite how it might sound. So, another success on this longlist for me! I hope Room makes it through to the shortlist (announced next week) - it certainly deserves to do so. Another author of whom I had previously been unaware, I'll certainly have to look into some of Donoghue's earlier novels (Room appears to be her ninth book, according to the list inside). As I've said before, the discovering of new (to me) novelists is one of my favourite things about following the Booker Prize each year - even if I'm not always happy with the winner, there's usually something of interest brought to my attention. Next time: All the Stars in the Bright Sky, by Alan Warner. Good post, bro. I will be reading this book based on your recommendation - it does sound very interesting.